Today Statewatch and Drone Wars UK are co-publishing a new report into the use of unmanned drones in UK airspace. 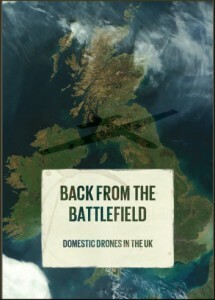 Back from the Battlefield: Domestic Drones in the UK written by Chris Jones of Statewatch examines the current use of drones in UK airspace by public and private bodies looking in particular at their use by police and border control authorities. The report argues that it is essential for widespread debate, discussion and democratic decision-making on the issue of ‘domestic’ drones in order to establish acceptable limits on their deployment and use by public authorities, private companies and individuals. Despite strict Civil Aviation Authority (CAA) regulations that control and limit the use of drones in UK airspace slowly but surely the number of drone operators is increasing. In late 2011 Drone Wars UK revealed that around 50 to 60 annual ‘permissions’ were granted by the CAA to private companies and public institutions to fly drones in UK airspace. According to the CAA’s latest update there are now more than 220 public bodies and private companies that have permission to fly in the UK. However if plans to allow unmanned drones to fly freely in civil airspace are implemented – supposedly in 2016 – that number is likely to rocket. The first section of the report examines the regulations and law governing the use of drones. The CAA currently tightly regulates the use of drones in the UK due to safety concerns. While this frustrates many would-be drone entrepreneurs, a number of crashes by small drones at public events over the past year has led to death and injuries and show that strict regulation is absolutely necessary (see here andhere and here and here. In February 2014 the UK industry body representing insurance underwritersargued for significant changes to the way drones are currently being regulated due to “significant hazard, loss and risk” they pose. In addition the danger posed to other aircraft is causing disquiet. Earlier this month the US equivalent of the CAA, the Federal Aviation Authority (FAA), revealed that a small drone had nearly collided with an airliner over Florida in March 2014. Such a collision could have “catastrophic results” said the FAA. The report also addresses the other major concern with regard to the use of drones in civil airspace: privacy. The government has argued that the Regulation of Investigatory Powers Act 2000 and a recently adopted Surveillance Camera Code of Practice have to be taken into account should public authorities wish to operate drones. However, both contain numerous shortcomings and neither applies to private companies or individuals. Given the National Security Agency’s widespread spying and efforts by advertisers and Internet companies to track consumers online, another technology capable of conducting mass surveillance could become a serious threat to privacy. Behind the scenes the UK government has set up a ‘RPAS Cross Government Working Group’ to promote the use of ‘Remotely Piloted Air Systems’ (aka drones). However protecting the civil liberties and privacy of UK citizens does not even rate a cursory mention in the terms of reference for the group obtained by Tom Watson MP last month. In addition, while the European Commission has stated that it will “set tough new standards to regulate the operations of civil drones” details are yet to be seen. 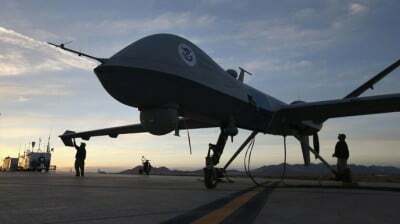 The report also looks in some detail at the use of drones by police and border agencies and suggests that the UK National Crime Agency (NCA) may already be using surveillance drones. 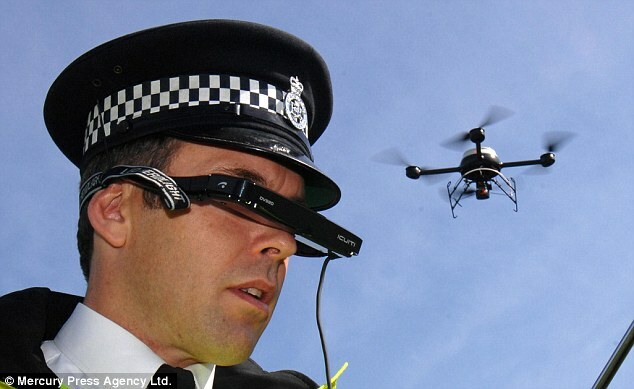 12 of Britain’s 51 regional police forces are known to have used drones to some extent over the last five years, but due to CAA restrictions such use has mainly been restricted to trials such as currently being undertaken by Sussex Police at Gatwick airport. Currently only Staffordshire Police and the PSNI are making regular use of drone technology. Although early steps into drone use by the police have been tentative (and once or twice pretty embarrassing) it is likely to increase in the future. Finally the report reveals that at least £80 million of public funding from both UK and EU institutions has gone towards the development of drones or the technology and facilities seen as a prerequisite for their use. Far more will likely be spent in the future – a consortium led by BAE Systems has just received an undisclosed amount to investigate “unmanned aviation in the civil market” as part of a £60 million push to “keep Britain at the forefront of the global aerospace market”. While the developments in the use of civil drones is being backed by numerous public and private interests, there appears to have been relatively little – if any – thought given to the issues raised by the potential widespread introduction of domestic drones. It is essential that a widespread debate on these issues takes place now, before it is too late.